Servius. 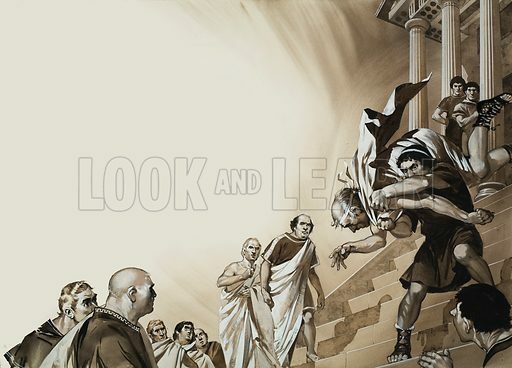 When King Servius arrived at the Senate, his ambitious son in law, Aruna, leapt from the throne and threw the king down the steps. Original artwork for illustration on pp4-5 of Look and Learn issue no 615 (27 October 1973). Lent for scanning by The Gallery of Illustration. Available worldwide for immediate download up to 4,716 x 3,393 pixels.